Above Program for a performance by legendary Gitana flamenco dancer Carmen Amaya,c. 1950s. 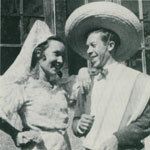 The author’s great-aunt Nicanora and great-uncle Cuate, performers at the Santa Fe Fiesta. 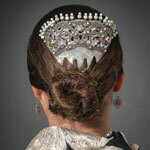 A Traditional flamenco hair comb by Cristina Soro. Feria de Abril attendees, Seville, Spain, 2012. I WAS NINE YEARS old when I first peered through the painted windows of La Plazuela at La Fonda Hotel, drawn by music that was familiar to me. It was flamenco, and I’d heard it on the cassette tapes that my grandfather brought back from his many trips to Spain. The voices of the singers were raw, primal, melodic, poetic, and even meditative, resonating with the form’s roots among the Spaniards and Romani “Gypsies” of 18th-century Andalusia. It was 1980, and María Benítez was performing with her troupe Estampa Flamenca Teatro Español. I was mesmerized. 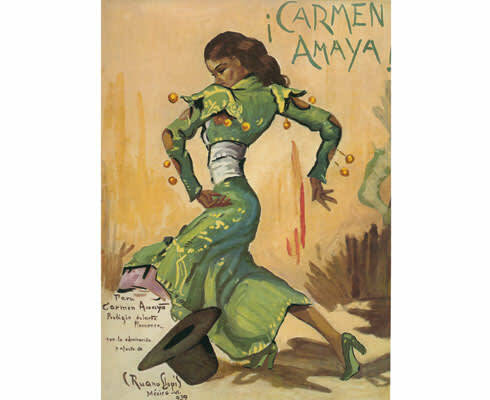 Her movements caused her colorful flamenco dress, with its long blue-and-green train (bata de cola), to undulate, so that it became an extension of her body. 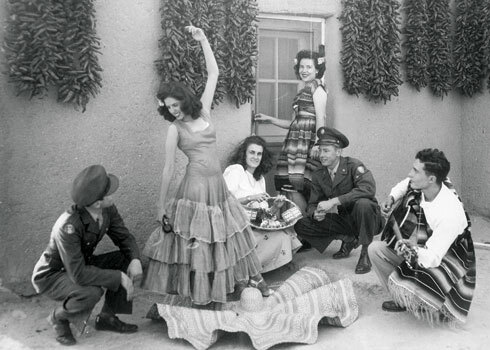 Santa Fean Betty Serna Cárdenas performing for the USO, c. 1947. I didn’t know it then, but this woman dancing a few feet from the Plaza was a world-renowned flamenco dancer. She chose to spend summers in Santa Fe, both because she had grown up in New Mexico and because the state was, and remains, the capital of flamenco in the United States. She later appeared on the cover of Dance Magazine, wearing the very same dress I saw that night. Transfixed, I instantly wanted to learn to dance flamenco too. Author Nicolasa Chávez performs the Tango de Málaga at El Pinto in Albuquerque, with Lili del Castillo’s group Rincón Flamenco, c. 1995. 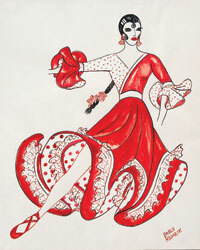 Flamenco costume sketch by UNM adjunct professor Pablo Rodarte, c. mid-1990s. 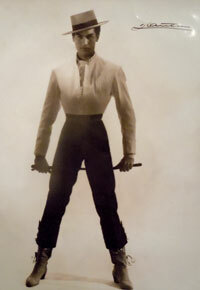 Vicente Romero, credited with bringing flamenco to NM, c. 1957. He was Chávez’s first teacher. When I was 11 years old, I began private lessons with Vicente Romero, who first invited Benítez to dance with him at the Tesuque restaurant El Nido. Many in northern New Mexico credit him as the one who brought true flamenco gitano (Gypsy flamenco) to New Mexico in the 1960s. 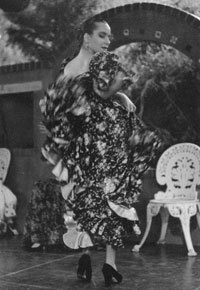 As with Benítez, I did not know then that he was famous and had toured the world in the companies of Pilar López and José Greco, the US’s first flamenco icon. Rather than practice technique in a large studio with other students in matching leotards, I learned flamenco dance steps on the wooden floor of Vicente’s living room. With a glass of Scotch on the rocks in one hand and a cigarette in the other, he danced and had me repeat the moves until they all came together into one organic motion. Four years later, I moved to Seville, Spain. We lived in the Los Remedios neighborhood, then a bustling suburb. I took lessons at a local neighborhood dance studio but quickly noticed that flamenco was everywhere. Teens roamed the streets, singing and doing the palmas, a special type of hand clapping that incorporates the various rhythmic structures of flamenco. Young men broke out in song, which was something I had never heard at home. 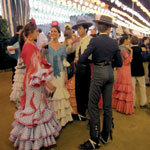 Our house was only two blocks from the grounds of the annual Feria de Abril (April Fair). During the feria, the streets were crowded with women in flamenco dresses of every color of the rainbow, and men in riding outfits referred to as trajes camperos. Horse-drawn carriages rolled down the street, full of people in their flamenco finery. Music was everywhere and played all night. Everybody knew how to dance or sing. I first assumed, as many do, that flamenco had been performed in this state for centuries, and that my love for flamenco and other traditional music was connected to my 14th-generation New Mexican heritage. My earliest ancestor on this continent, Don Pedro Gómez Durán y Chávez, came to New Mexico in 1600, and my Roybal ancestors arrived in 1693. (My great-uncle Fray Angélico Chávez was a historian who wrote the first complete genealogy of New Mexico’s founding families.) More recently, my great-grandmother Nicolasa Roybal was a musician who taught piano lessons, and my great-aunt and great-uncle, Nicanora and Cuate, danced and sang annually on the rooftop of La Fonda during the Santa Fe Fiesta. While I was away, flamenco’s presence had continued to grow. I returned in 1988, as Albuquerque and UNM were gearing up for the second annual Festival Flamenco Internacional de Albuquerque. It featured local performers, including my teacher Vicente, as well as guest artists from around the country, and was the brainchild of UNM flamenco dance teacher (and alum) Eva Enciñias-Sandoval. My flamenco education resumed in New Mexico as I studied with a teacher in the local flamenco family: the renowned Lili del Castillo, a former dancer with Vicente. I went on to join the UNM flamenco ensemble Alma Flamenca. Eventually I joined María Benítez’s Segunda Compañía (an earlier rendition of the current Flamenco’s Next Generation). It was a time when I and others could still learn flamenco firsthand from what I refer to as the first generation of New Mexican flamencos. While working on my master’s degree in European history, I also continued to study New Mexico history. I soon discovered that I was related to Vicente’s family on my Roybal side. I found other connections, too—Eva Enciñias-Sandoval and Lili del Castillo were both grand-nieces of Cándido García, a classical Spanish dancer who had a successful career in New York. 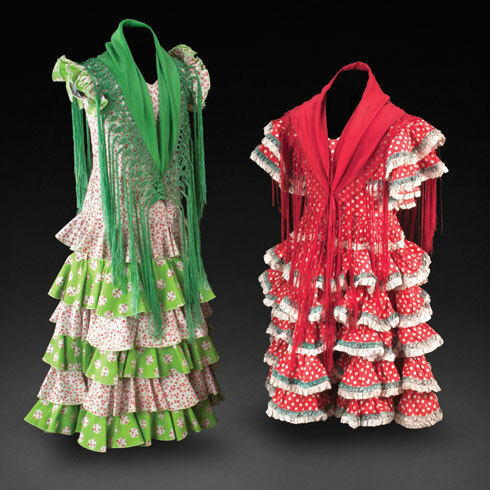 Two children’s feria dresses from Seville, Spain, from the 1990s (left) and 1960s (right). NOVEMBER 22, 2015– SEPTEMBER 11, 2016 Flamenco: From Spain to New Mexico, in the Museum of International Folk Art’s Hispanic Heritage Wing. Exhibition opening events take place Sunday, November 22, from 1 to 4 p.m, including a guitar performance from 1 to 2 p.m. and a book signing of The Spirit of Flamenco: From Spain to New Mexico with exhibition curator and author Nicolasa Chávez from 1:30 to 2:30 p.m. Enjoy live performances with 12 flamenco artists from Spain and NM, from 2 to 4 p.m. Tapas and beverages provided by the Women’s Board of the Museum of New Mexico. December 13 at 3 p.m., MOIFA presents Un Cuento Navidad Flamenca, with guest artist Fernando Barros Lirola and others. On Sunday, January 31, at 2 p.m., the museum will host a flamenco charla, or conversation, with Teo Morca, Vicente Griego, and others. On Sunday, March 20, at 2 p.m., the museum presents a performance by Uxía y Narf, two Galician musicians. For further information, visit internationalfolkart.org. The National Institute of Flamenco in Albuquerque is home to various dance companies, as well as the Conservatory of Flamenco Arts. It hosts Festival Flamenco Internacional de Alburquerque each June, which draws flamenco performers from all over the world. (505) 242-7600; nationalinstituteofflamenco.org. La Casa Flamenca is run by Valeria Montes and Jesús Muñoz, who give classes and bring in guest teachers. (505) 247-0622; casaflamenca.org.